Teddy Bridgewater made his NFL debut as the Vikings dropped today's contest in New Orleans, 20-9. Daniel House opens up his notebook and allows you to see all of his observations from the game. The Minnesota Vikings competed hard, but injuries and one key turning point all contributed to the Vikings 20-9 loss. 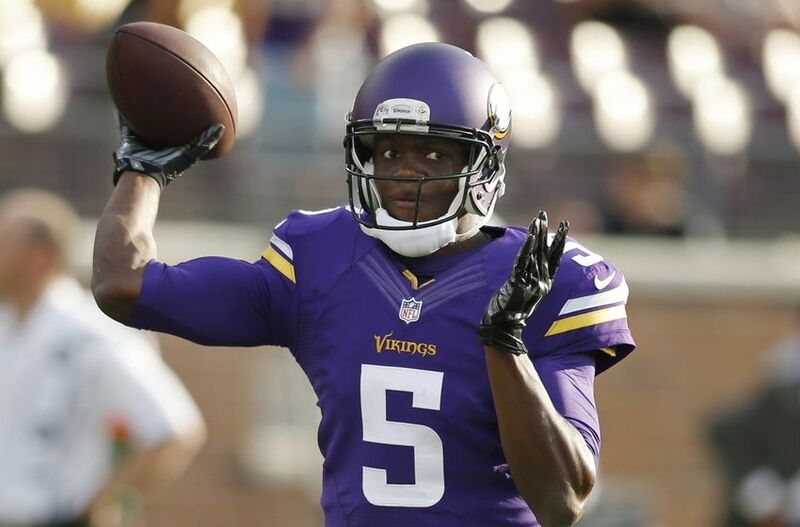 Quarterback Matt Cassel was injured late in the first quarter and Minnesota fans were able to witness Teddy Bridgewater take some of the quarterback reigns. The Vikings defense held a Saints offense to 20 points on their home field. New Orleans was averaging 34 points per game last season and went undefeated last season at the Superdome. The Vikings offense couldn't get into the end zone today, but moved the ball up the field and settled for field goals. Teddy Bridgewater remained poised and performed well when entering the game on the road for his first NFL action. The Vikings offense remained anemic in a sense and hasn't been able to reach the end zone in almost eight full quarters. Nonetheless, Bridgewater entered the game unprepared and was thrown into the fire in a hostile environment. A key penalty on a third down sack by Captain Munnerlyn resulted in an unnecessary roughness infraction. That kept the Saints drive alive and the penalty later led to to an 18-yard touchdown from Drew Brees to Marques Colston. This put the Saints up by 11 points and they never looked back, knocking off the Vikings 20-9. I complied all the notes from today's game and allow you to take a glance inside of my notebook. Matt Cassel was injured late in the first quarter and reports indicated he may have sustained some broken bones in his left foot. He was running the football up the middle and as he was trying to stretch for a first down, his ankle was bent in an awkward position. Cassel was carted to the locker room and did not return. He may miss some time with this injury meaning Teddy Bridgewater will see some action in the future. Bridgewater entered today's game with a calm and cool demeanor. He finished the game 12-for-20 with 150 yards passing. The Saints were consistently throwing blitz packages at Bridgewater, but he stood tall in the pocket and made the throws up the field. His passes to the sideline will crisp and you could see his uncanny ability to roll to his right and make a strong throw up the field. He is a very poised individual and with the current injury reports, Teddy may be starting over the next couple weeks. Matt Asiata rushed for just 35 yards on 12 carries and Teddy Bridgewater added another 27 yards on the ground. Jerick McKinnon finished with -1 rushing yards on just two carries. Asiata managed to haul in three catches for 36 yards through the air, but he failed to show any elusiveness in the run game. He was unable to shake tackles and is a pure between the tackles runner. The Vikings offense hasn't been able to be very well balanced over the last two weeks and it is becoming very concerning. The team is without one of the best running backs in the game, but they need to find a player that can make an impact at this position. McKinnon looks like he is behind the learning curve and the coaching staff hasn't awarded any snaps to third-string runner Joe Banyard. The Vikings could look to add a running back in free agency, but the market appears to be bleak. Greg Jennings hauled in five catches for 70 yards and he continually was making plays towards the outside of the field. Bridgewater was finding Jennings frequently when came out of his reads over the top of the defense. Cordarrelle Patterson notched four catches for 61 yards, but wasn't used in any special packages again this week. Patterson is a receiver that can move the chains through short and intermediate routes, but he has been unable to emerge as a vertical threat within the Vikings offense. Much of this could be related to Teddy entering the game late and not having plays designed that he was ready to perform on the field. Stay tuned for how the wide receivers play with a full week of designed gameplan structures for quarterback Teddy Bridgewater. Kyle Rudolph left the game at the midway point of the fourth quarter with a reported groin injury. Rudolph indicated to the media that he has been battling this injury for the last couple weeks. While he was in the game, he notched three catches for 27 yards, but added a drop early in the game. Rudolph hasn't been playing within his natural form and a prolonged injury is something the Vikings offense doesn't need when they are trying to get the group clicking again. If Rudolph is held out with this injury, the coaches will be turning to tight end MarQueis Gray to supplant the reps. The Vikings offensive line may have made a slight improvement this week, but their performance was still rather underwhelming. They allowed just two sacks as a unit, but countless hurries led to multiple throwaways on offense. Matt Kalil was beaten on three occasions and Cameron Jordan made him look like a fool off of the line of scrimmage. Kalil is a step slow off of the ball and he is just simply being handled out of his stance. The rest of the offensive line played relatively well, but Brandon Fusco left with a right shoulder injury. Backup Vlad Ducasse entered and was called for a holding penalty and defensive coordinator Rob Ryan was overloading hard towards Ducasse. If Fusco cannot play next week, this could be an area of concern in next week's game. Early in the game, Drew Brees was nearly unopposed in the pass rush, but as the second quarter approached, he was pressured more frequently. They were only able to reach Brees once, but they applied several hurries and allowed him to throw the ball early. Still, Brian Robison and Everson Griffen both couldn't close on sack opportunities and these types of plays are necessary for the defense to make plays. Anthony Barr notched his first sack in the league and the coaches were consistently dialing up packages to pressure the Saints front four. The defensive line awarded just over 100 yards rushing and many of these came as time ticked down in the waning moments of the game. The Vikings linebackers were held with the responsibility to stop one of the premier tight ends in the league. Jimmy Graham was kept in check and was held to just 54 yards on six catches. The Vikings have held both Rob Gronkowsi and Jimmy Graham to under 55 receiving yards over the last two weeks. This was a rather solid duty and if it wasn't for Chad Greenway getting beat on two or three occasions, this stat would be improved. Gerald Hodges entered the game late and brought some energy in run support and in nickel pass coverage situations. Anthony Barr shut the door on two screen plays today and played relatively well today. He is slowly improving with more coaching and playing experience on the field. A key penalty on a third down sack by Captain Munnerlyn resulted in an unnecessary roughness infraction. This kept the Saints drive alive and the penalty later led to to an 18-yard touchdown from Drew Brees to Marques Colston. The call was questionable to some, but the play quickly shifted the momentum of the game in the direction of the New Orleans Saints. Josh Robinson allowed two first downs in third-and-long situations and after performing well in this area over the last two weeks, he regressed a little in today's action. His efforts in run support were much improved, but he still needs to show consistency in the big situations. Harrison Smith made several plays over the top in coverage and added a brilliant third down tackle early in the game. He did drop an interception he should have hauled in, but he made up for this mistake by deflecting a pass over the top just one play later. He is playing at a high level and is one of the key pieces to the Vikings defensive success. As for Robert Blanton, he did not perform at a very high level today. He was beaten four times, one which resulted in a 38-yard touchdown strike from Brees to a man named Josh Hill. He was having some communication issues and his positioning and alignment on the field left me scratching my head. It will take another look at the film, but it appears Blanton was a liability on defense today. In closing, Jimmy Graham taught Blanton how to be a man not just once, but twice, today. There were no hitches in the Vikings kicking game and Blair Walsh added three makes from 25, 30, and 40 yards. He always performs well in dome stadiums and continued this trend in New Orleans today. The injuries piled up on both sides of the ball for the Vikings today. Quarterback Matt Cassel left with a foot injury, Brandon Fusco exited with a right shoulder injury, Chad Greenway injured his ribs, Kyle Rudolph aggravated a groin injury, and Josh Robinson tweaked his hamstring. All of these injuries are a concern and leave the Vikings with limited personnel to sort out all of the issues they are facing. The Vikings will return home to take on the Atlanta Falcons next Sunday at 3:25 p.m CT.